Betty's Day Care Academy Inc. The IWS Children’s Clinic kicked-off National Children’s Dental Health Month with a Brush-a-thon at Pershing Elementary School in Berwyn, Illinois. 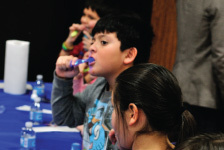 With the help of Smiles Across America/Oral Health America, Firefly toothbrushes and 70 plus second grade students who participated in the Brush-A-Thon event raised awareness of good oral hygiene in youth and its role in preventing childhood dental disease.